I feel like I live in the dark ages sometimes when so much about technology is whizzing by and I am supposed to keep up with it all. But while I use technology constantly, and I love tinkering with new devices and software, I still use an older computer running Windows 7 because the last thing I want to happen on my main computer is for it to hiccup when I am writing, paying bills, keeping up with my friends on Facebook, or seeing how well Starbuck’s stock is doing. As you can see, I do type quite a bit and for years, have heard about these high end keyboards that have incredible response times and are supposed to be a joy to work with. A keyboard? Well for those of you that might remember Northgate, they were the makers of a keyboard that weighed a ton, lasted nearly forever, and you got your exercising in while typing; but they worked beautifully and people loved them. Today, most people just use what ever that came with the computer. Usually a $20 no name brand. The first think I notice was how heavy the keyboard was compared to my current Logitech. The second thing I notice (besides the well put together packaging, soft cloth to protect it in shipping, and seven language operating manual) was the very long and thick USB cable, near seven feet. The keyboard is also enclosed in a sanded aluminum case. Put it together and I must say I am quite impressed. You just plug it in and are ready to go. With the non stick pads on the bottom, the keyboard stays where you put it. It certainly has a different feel to it and by running it through a USB cable, you don’t have any of the vagaries of the wireless keyboards that seem to constantly cause me problems. The palm rest is made of heavy plastic and has a rubber coating on it to also keep your hands from sliding around as well. It attaches to the keyboard with a heavy magnet so they warn you not to put any electronic memory cards near the front of the keyboard. They even tell you how strong the magnet is. 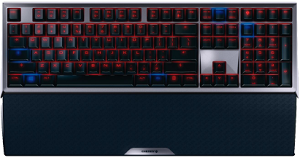 Each key is backlit with a red LED and while it is quite bright out of the box, it can be adjusted very easily to whatever level you want that is comfortable for you. Hit the keys like the NumLock, Scroll, and CapsLock and they turn blue to let you know they are turned on. You can even deactivate the Win key. It is a nice feature to be able to sneak into the office late at night and not have to turn on all the lights to just check the email one last time. Besides what I mentioned above, what really sets this keyboard apart is the mechanicals under the keys. It was built for speed in typing. With things like a Gold Crosspoint precision module for each key, RealKey technology, and Full N-Key rollover to allow all keys to be read simultaneously. Even the keys themselves are molded so your fingers fit them easily which can make for faster typing. We are talking a solid, well built, and functional keyboard. So is spending $219 on a keyboard worth it? That really depends on how much typing you are going to be doing and I have to admit, having used it for this article and for my email messages has made things a lot easier on me. It is like a good office chair, if you are going to be in it for a long time, get a good one. I like this keyboard and plan on using it for a very long time so for me, yes it is worth it. The Cherry MX Board 6.0 is available now on Amazon and NewEgg among others.